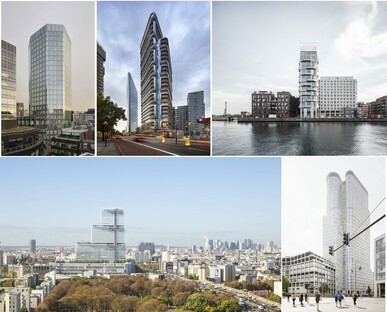 According to CTBUH, Europe has five beautiful skyscrapers: Angel Court by Fletcher Priest Architects and Canaletto by UNStudio in London, the Paris courthouse designed by Renzo Piano Building Workshop, The Silo by COBE in Copenhagen and, last but not least, Upper West by Langhof + KSP Engel und Zimmerman Architekten in Berlin. 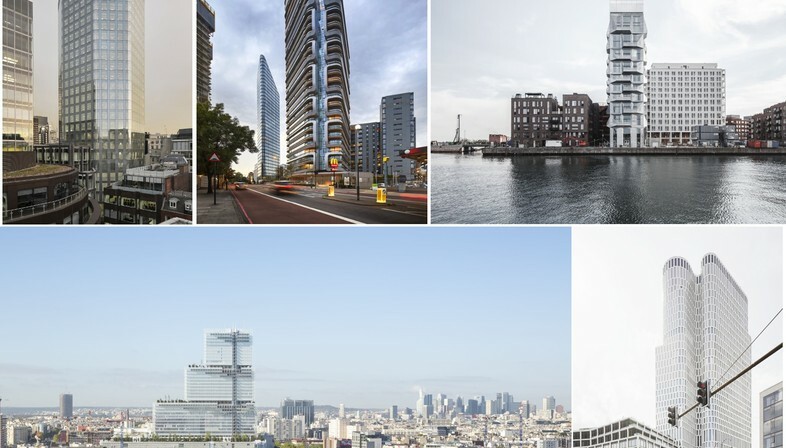 The five buildings compete for the title of Best Tall Building Europe 2018 to be awarded May 30 and 31 in Chicago at the first annual Tall + Urban Innovation conference. On that occasion the Council on Tall Buildings and Urban Habitat (CTBUH) will announce the winners of all the regional Best Tall Building awards and choose the "2018 Best Tall Building Worldwide" from among these. The building designed by Fletcher Priest Architects stands in an important historic setting. The Bank of England Conservation Area is an area in the heart of the City of London where no new constructions are allowed, to preserve not only historic buildings such as the Royal Exchange, the Bank of England and the Mansion House but the historic grid of streets, courtyards and lanes characterising the whole area. The skyscraper fits into its historic surroundings, replacing a building constructed in the 1970s. The architects have preserved the older building’s height while increasing net available floor space by 60% through optimal distribution and organisation of layout. The translucent skin of the walls covers the entire volume evenly, letting daylight in to give the building an appearance of lightness. This residential building designed by UNStudio is a tower on 31 levels, including apartments and services (a restaurant, a swimming pool, a wellness centre, a multimedia hall and a club lounge with a patio). 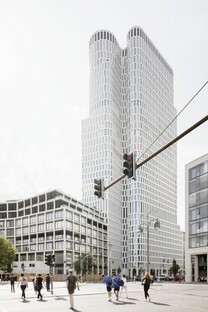 The building’s distinctive façade is a continuous curved strip grouping together multiple floors: a solution that visually limits the skyscraper’s verticality, recalling the small scale of the adjacent buildings. 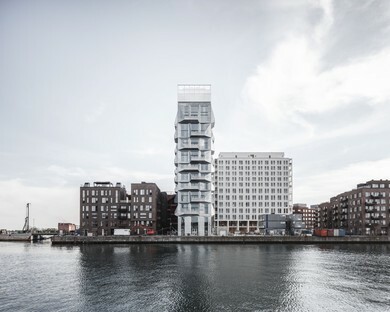 In Copenhagen’s North Harbour, COBE transformed a former industrial construction, a big grain silo, into a residential skyscraper containing 38 apartments, with public space on the ground floor and a restaurant at the top. The galvanised steel façade shelters the building from the weather while underlining the construction’s monolithic nature, making it an urban landmark visible throughout the area. The panoramic roof-top patio, floor-to-ceiling windows and balconies in all the apartments provide panoramic views over the Copenhagen skyline from everywhere in the building. Designed by Renzo Piano Building Workshop and completed in the autumn of 2017, the Paris courthouse will become fully operative over the months to come, following implementation of increased antiterrorism security measures following the attacks in the French capital. The building is a 160 metre high skyscraper, a vertical city composed of a base over which three rectangles of decreasing size are added. The base contains the reception area and public services, while the three upper blocks contain offices. The horizontal separation of the blocks is underlined by the presence of garden patios: the building has a total of one hectare of gardens containing about 500 trees. 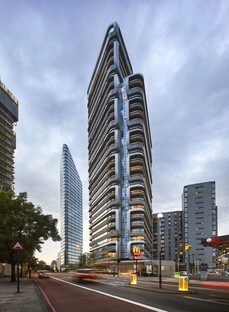 The skyscraper designed by Christoph Langhof + KSP Jürgen Engel Architekten stands at the eastern end of the famous Kurfürstendamm avenue. Inaugurated in the spring of 2017, it is one of the city’s tallest buildings: 118 metres, or 35 floors. The volume is made up of a base and a tower for a variety of different uses. The base contains shops facing directly onto Breitscheidplatz and is 37 m or eight floors high, on the same scale as the nearby Gedächtniskirche. 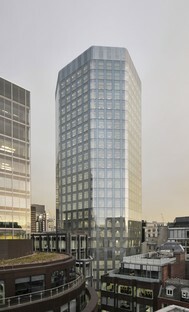 The tower contains offices, a hotel and a sky bar with a panoramic terrace on the 35th level.